Virtual beauty enhancement has become easier than ever with beauty apps like YouCam Makeup and BeautyPlus. You can insert new eyebrows, change your eye color, and remove blemishes from your skin. This sounds wonderful, doesn’t it? I mean, who actually meets people in real life anymore? If anything, popularity and looks are all surfacing around your retouched Instagram selfies. But for those who like to enhance their looks beyond filters and virtual touch-ups, there’s YouCam Makeup, a free beauty app available on Android and iOS operating systems. With the YouCam Makeup beauty app, you can enhance yourself virtually, and then learn techniques through tutorials to achieve a new look. In this post, I am going to review YouCam Makeup’s hair features, makeup features and tutorials. Recently, YouCam Makeup introduced a new feature, live hair dye, to create a more natural transformation rather than synthetic look. The YouCam Makeup beauty app has let its millions of users alter their face with make-up, new eyebrows, and blemish control features. YouCam Makeup users could also apply a new hair style. It had the same effect as dying your hair, but it wasn’t your hair. It felt like a wig, as you can see in the pictures below with my red hair and blonde hair. The hair apps simply made me want to curl and volumize my hair. The final look resembles a cartoon character or a magazine cutout. All of my life, I have wanted to be blonde. However, going from level 5 brown hair to blonde is a major transformation. In order to transform my hair, I would have to bleach it, which would ruin my hair. 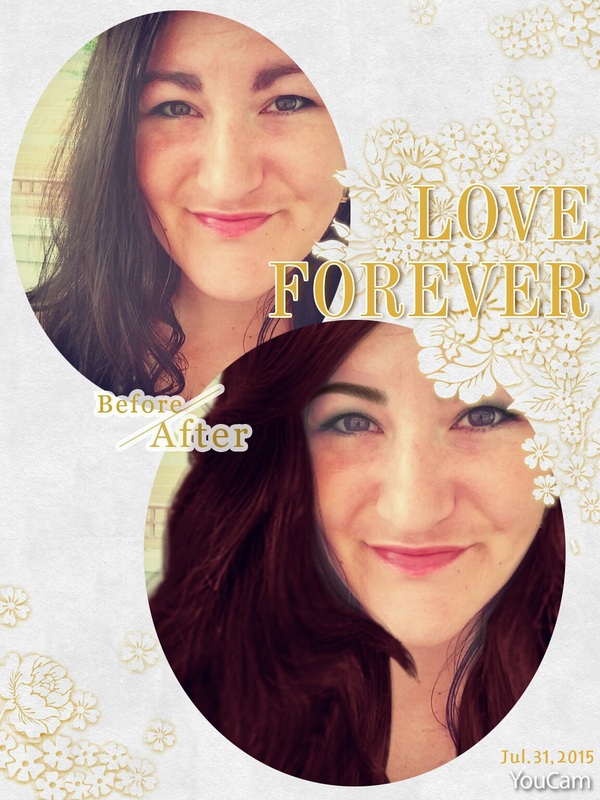 Before getting out the chemicals, I can, thanks to YouCam Makeup, virtually dye my hair. 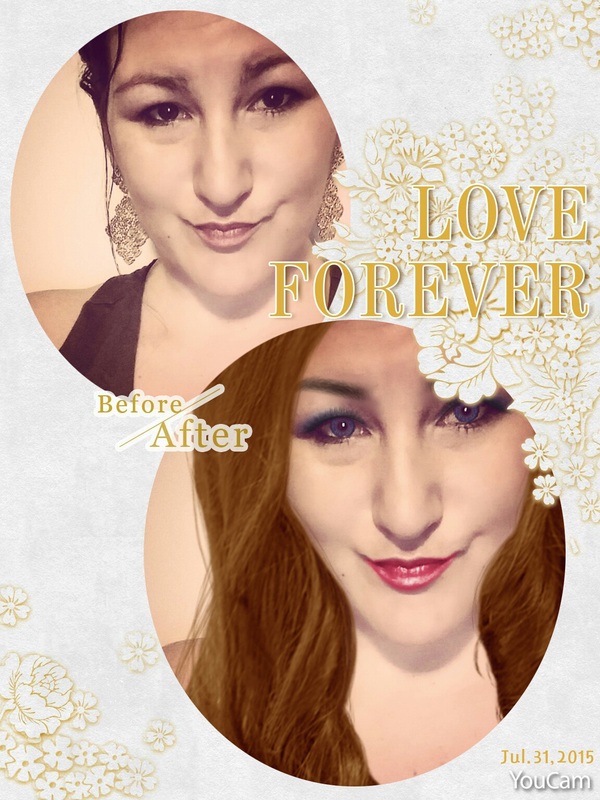 With YouCam Makeup’s new feature, the live hair dye feature, you can lighten or darken your actual hair. The app feature let’s you adjust the shine and the color, which includes more than 30 hair colors such as, red, blonde, brunette, and blue. Below is my dark hair dyed the lightest shade of blonde with 100 percent coloring. I think that the app gives you an idea of how you would look with a different hair color. The color is applied to your hair, but it isn’t perfectly painted on. So, it doesn’t look completely natural, but it is a great way to visualize how you would look with different shades. It definitely feels more natural than the previous hair option. 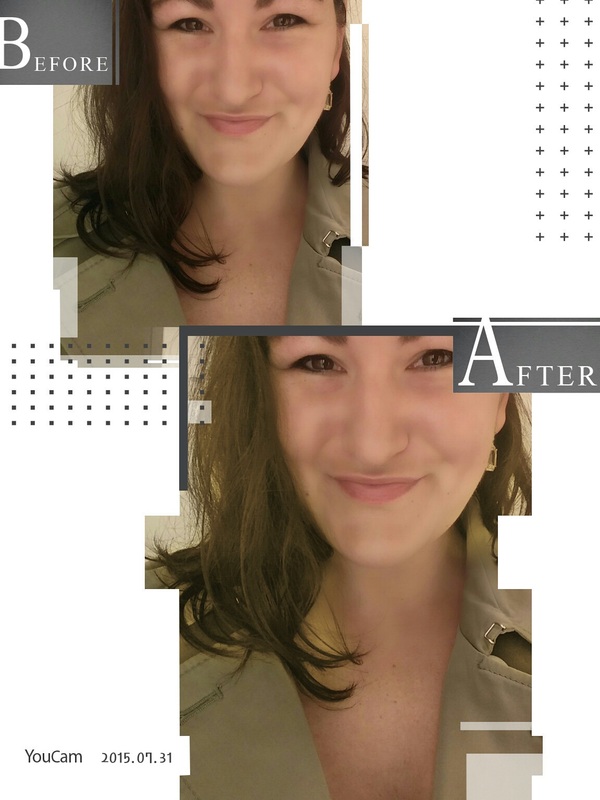 While dying your hair is fun, I think YouCam Makeup’s best features are in their make-up portion of the beauty app. You can select six categories to alter or enhance your selfie. These include: looks, face, eyes, mouth, hair, and accessories. The best three categories are: looks, face, and eye. For looks, you can choose between costume make-up and natural make-up. Then, you can select from over 20 looks including: bashful, dreamy, cool, and stylish. Simply click and you have a newly painted face from foundation to eye shadow. For face, you can smooth skin, apply foundation or blush, use face paint, re-shape your face, contour your face, enhance your nose, remove shine and remove blemishes. With a click, you can have perfectly contoured, tan skin. The last feature that impressed me was the eye category. Not only can you remove red-eye, but you can remove bags from under your eyes! You can apply various lashes, enlarge and change the color of your eyes, and apply new eyebrows. Beyond virtual enhancement, you can achieve (some of) the look in real life with the help of YouCam Makeup’s tutorial. The app integrates with YouTube to provide make-up tutorials from make-up artists around the world. Achieve looks in the following categories: new, hot make-up, summer, celebrity, work, dating, and party. I love this feature because you have a variety of different make-up artists to choose from and you can view the videos within the app, instead of opening up a new app. Dress-up is getting virtual, and yes there are tiaras and tutorials to help you. Some features are harmless, like a little contouring, some blush, and hair dye. It’s fun to reinvent your look. The trouble comes when you have spent nearly an hour virtually enhancing yourself. You can’t get bigger eyes or perfect your nose with a brush of a stroke. If you keep it fun and inventive, this app is awesome. Just try not to get carried away. I will admit that I got trapped in this app. All I wanted to do was buy a new Mac lipstick, get my eyebrows done, and contour my face (something I have never done). I even went as far as thinking about plastic—no, I won’t even say it. But then I had to get back to reality and realize that I am neither a Kardashian nor a Jenner. It’s all pretend. Remember you are beautiful. Looks do matter in this world. The looks that matter are a smile, a clean scent, and a glowing face. You don’t need Botox or a virtual app. Try out a beauty app, but come back to your own unique beauty.